DETROIT (AP) No matter what the Detroit Lions did near the goal line, it turned out badly. 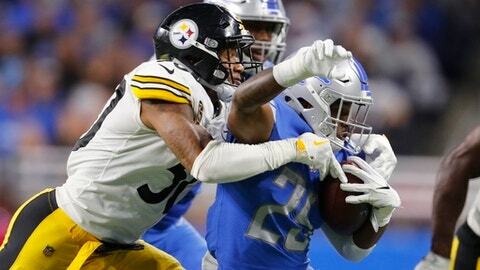 Detroit’s 20-15 loss Sunday night included three crucial second-half possessions by the Lions inside the Pittsburgh 10-yard line. On two of them, Detroit failed to score at all, and on one, the Lions settled for a field goal. ”They wanted to stop us more than we wanted to get in,” Lions receiver Golden Tate said. Detroit’s night began going sour in the third quarter. Down 13-12, the Lions were poised to take the lead in some fashion when they had first-and-goal from the 4. Dwayne Washington ran for 3 yards, then Matthew Stafford threw incomplete. A third-down run by Washington was stopped for no gain, and after taking a shotgun snap, Stafford was stopped while trying to run up the middle. That missed opportunity might not have been so bad, but the Lions then allowed a 97-yard touchdown pass from Ben Roethlisberger to JuJu Smith-Schuster that made it 20-12. Detroit immediately drove back down the field and again faced first-and-goal from the 4. The next three plays were similar to the Lions’ previous trip to the red zone, but in a different order. This time the incompletion came on first down and was followed by Washington’s run to the 2. Then Washington was stopped on third down. Detroit settled for a 19-yard field goal by Matt Prater. The Lions indeed had another chance toward the very end, but this time they never got closer than the 6. On third down, a run by Theo Riddick went for a loss of 2, and Stafford threw incomplete to turn the ball over on downs. Detroit had 482 yards of offense, the third-most by a team that didn’t score a touchdown, according to Pro-Football-Reference.com data that dates back to 1940.